Now, gross fixed capital formation is the biggest part of the macroeconomic variable investment (the smaller part are changes in inventory). Real estate construction is part of gross fixed capital construction, so in part the fall in investment has been caused by an end of the real estate bubble. Not all GDP comes from the production of investment (goods), though. Consumption goods and goods and services sold to the government are also part of GDP, plus net exports (exports minus imports). If we wish the euro zone to have less unemployment, there most be more goods produced. Goods are only produced if people demand them, so the question comes down to who is going to finance the purchase of additional goods. There are three potential sources: the private sector can spend more than it earns by running up debt. It does this by borrowing from banks. However, in most of the euro zone private sector firms and households are not in the mood to move into debt further. The second possibility to increase growth is for the public sector to spend more than it earns (taxes). This seems like a possible way to go, since the German “black zero” is not strictly necessary. 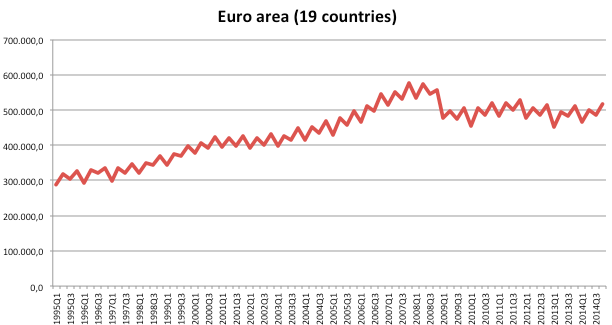 Last but not least the rest of the world can buy more of the euro zone’s goods. For this a depreciation of the currency would be helpful, and the ECB has just engineered this by quantitative easing, which means an increase in central bank money held by banks. However, if pushing the exchange rate down leads to more exports for Europe (and that is a big if), then at some point Europe will grow stronger and investors will come back to invest. This would drive the euro up again, which would lead to weakness of demand once again. In the last 4 years the euro zone authorities have tried to increase investment by talking up markets (“confidence”), by low interest rates (ECB), by pushing wages down, by deregulating and privatizing. After all this did not work, it is now a depreciation of the euro that is supposed to increase aggregate demand in the euro zone? Is this not the beggar-thy-neighbor strategy that Germany imposed on the rest of Europe which led to the crisis in the first place? Well, the euro’s exchange rate is not fixed, and other countries will retaliate against “gains in competitiveness” that come via depreciation of the euro by depreciating their own currencies. Hence the solution to Europe’s economic woes – low investment – cannot lie with the rest of the world. It must lie in Europe.